Wonder Woman has debuted! It broke box office records and got rave reviews but people especially loved the Amazons of Themiscyra. In April I did a feature on the Amazing Amazons but more were added to IMDb since the film was released. Let’s say hello, shall we? While the film has resonated with a lot of people, and Amazon island was filled with diverse faces, there’s still a lot to be critiqued when it comes to representation. Most of the women I featured in my first spotlight (and this follow-up) went unnamed or without lines entirely (I couldn’t even spot most of the actors on these lists even after my second viewing of the film). Since the film hit theaters, IMDb updated their full credits list and I wanted to make sure the other actors got some attention too. Here’s 31 more inhabitants of Themiscyra who worked their butts off to bring the island to life. Josette Simon as Mnemosyne (young Diana’s tutor). If that name sounds familiar to you it’s because Simon is already famous in the geek world for playing Dayna Mellanby in the British sci-fi TV series Blake’s 7. She’s also very well known for her stage work with the Royal National Theatre and Royal Shakespeare Company. Caitlin Burles as Queens Guard, also her first acting role. Hari James as Trigona. She’s a police officer and has degree in sports science and a masters in sports psychology. She and a few other Amazon warriors spoke to Women’s Health about their training. Betty Adewole as Amazon Army. She’s an IMG model. Caroline Maria Winberg (as Caroline Winberg) as Amazon Army. She’s a mom and a Victoria’s Secret model who has hosted Sweden’s Next Top Model. When she was young she aspired to be a professional footballer. Lizzie Bowden as Amazon Army. I can’t seem to find any social media profiles for her but did find a Lizzie Bowden on IMG’s website. If anyone has any other info, please let me know! Kattreya Scheurer-Smith as Amazon Army. She’s an actor, model, artistic director, and playwright. Sharmina Harrower as Amazon Army. She’s a model with Storm. Rekha Luther as Amazon Townsfolk. She’s an Australian/Indian actor/model who’s also studying Ayurvedic medicine at the Kerala Ayurveda Academy. Thaina Oliveira as Amazon Townsfolk. I’m unfortunately not 100% sure on this one as there’s a few Thaina Oliveiras out there but seeing as how this one is a Brazilian model, also at IMG, it might be safe to assume she’s the one listed on imdb. Please let me know if you have any other information. Just discovered the portrait mode on the iPhone. We are all in trouble. Toma McDonagh as Amazon Townsfolk. Another one I can’t confirm, but also another IMG model. Gana Bayarsaikhan as Throne Room Amazon. If she looks familiar to you it’s because she had a small role as one of Nathan’s (Oscar Isaac) other versions of his artificial intelligence in Ex Machina. She also played mercenary Khutu in the film In the Name of Ben Hur. Camilla Roholm as Throne Room Amazon. She’s an actor and musician and like probably a lot of the Amazons she wrote, “I may have been almost entirely edited out but my name’s still in the credits. Woop! Proud to be even the tiniest minuscule part of such an awesome film.” She’s also a cat lover. Stephanie Haymes-Roven as Amazon Calvary General. This one is a bit interesting. I didn’t find any social media for her but I *think* she’s the wife of Charles Roven, co-founder of Atlas Entertainment and producer of The Dark Knight Trilogy, Suicide Squad, Man of Steel, Batman v Superman: Dawn of Justice, Wonder Woman, and Justice League. Moe Sasegbon, she’s a Nigerian heptathlete and physiotherapy graduate. And apparently she’ll be returning for Justice League. OemGeeee!! Spotted a more than life size me on the @wonderwomanfilm poster ! Told the guy at the counter and got a discount on my popcorn….FAME!! 3 more days!!! Tenika Mahoney is a UK based model who also has a Bachelor of Arts Degree specializing in dance. Ginger Sophie is a dancer and model. Jenny Pacey is an Olympian and Gladiator. Sarah Smith is a Ballroom, Latin and Tango dancer plus model and yoga teacher. Caitlin Dechelle does martial arts and stunts and has worked on Fast and Furious 7, Bones, Agents of SHIELD and more. 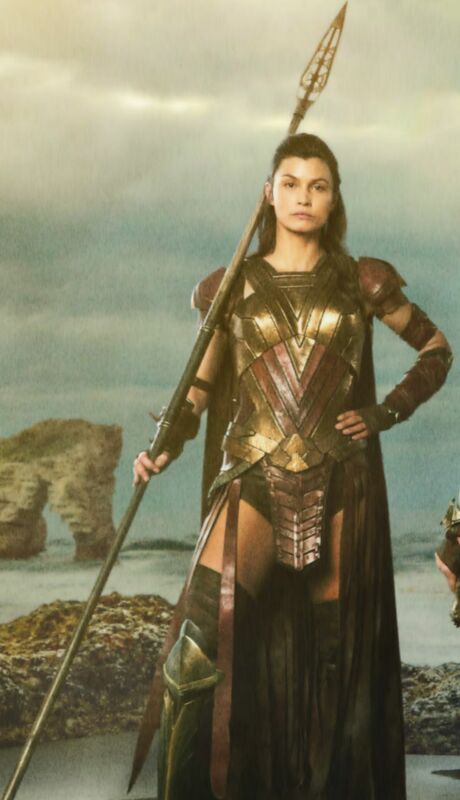 She was Gal Gadot’s stunt double on Wonder Woman. Wonder Woman's badass amazon nation! ⚔️ Picture courtesy of Clay Enos/ ™ & © DC Comics. Erin Bostock is a dog groomer, weightlifter, and ex-professional dancer. Armour-clad, on set of @wonderwomanfilm. Only a few more days to go to see this bad boy in the cinema. The ratings are in and it's sounding AMAZING. Loads more pics to come. Stay tuned. Christiaan Schodel is another stuntwoman. Jade Lye is a model and show jumper. Alicia Vela-Bailey is an actor, stuntwoman, dancer, and model. She’s also another familiar face, she played Alisha (aka Multiple Woman) on Agents of SHIELD. Jade V Lewis is an actor and model. Amazon warrior journey in pictures ⚔️❤️#bts @wonderwomanfilm Go check it out! I’d like to remember Lisa Loven Kongsli as Antiope’s lover, Menalippe. I’ve been trying to find confirmation of this but nothing so far. The characters are normally depicted as “sisters” but what little we saw of Menalippe I got the sense she loved Antiope romantically. Well, when Antiope is shot three people run over to her: Hippolyta, her sister, Diana, her niece, and Menalippe, for…reasons?!?! I’m just taking it as her being Antiope’s lover. If they don’t more spotlight in JL or WW2, the Themyscirans need their own movie! Thanks for bringing more of these wonder(ful) women to our attention!